Interested in Developing Your Psychic Abilities? • Choose the Span by clicking directly on it. • Click on "Shuffle" as many times as you would like. • Click on the "Reading" button and enjoy your free reading! • "Next" button will go to the next card in the reading. • "Previous" button will show you the previous card in the reading. • Clicking on the "New" button will let you choose another Span for another reading. • The "Cut" button cuts/gets rid of the current reading. 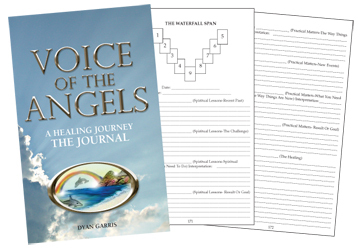 Angel Card Readings by "Voice of the Angels"
A Healing Journey – The Voice of the Angels CD by Dyan Garris. This is the first in the series for Automatic Chakra Balance,™ relaxation, help in sleeping and vibrational attunement of mind, body, and spirit. Six tracks of soothing instrumental music followed by a guided meditation on the last track, for healing, meeting guardian angels, chakra balance, and more. This is a delightful journey. 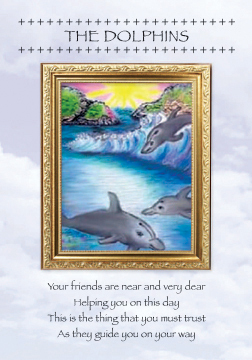 Voice of the Angels-A Healing Journey Spiritual Cards are based upon scenes from this journey. This is the 11th album by Dyan Garris, creator of a music and meditation series for healing, relaxation, help in sleeping, stress release, Automatic Chakra Balance,(TM) and vibrational attunement of mind, body, and spirit. The series has earned the "National Health & Wellness" Stamp of Approval. "Release" is eleven tracks of soothing instrumental music (no guided meditation) vibrating to and opening the seventh chakra. It was a 2007 New Age Reporter Lifestyle Award Nominee for "Best Album Cover Artwork" and "Best Relaxation/Meditation Album of the Year." The song "Illusions" on track five was recently #1 on Sounscapes cable TV music channel. Refer a friend for a paid reading and get a free reading! Below are Shawna and Alicia's predictions for 2010. 1. More and more people will be seeking answers and counseling from psychics. 2. There will be more spiritualist churches being formed. 3. There will even more attacks by pirates on cargo ships and cruise ships. 4. Some major businesses corporations will enjoy bouncebacks & prosperity yet others will crumble. A few shocking names will be revealed. 5. Many who have struggled through darkness with loss of jobs, homes, poverty and despair will be seeing a shift in the new year. Opportunities and blessings will be occurring along with a shift in consciousness. Many will also become of aware of why they went through these things and discover their true life purpose as their souls are being commanded to awaken for the upcoming vibrational shift in 2012. 6. Major racial tensions amongst blacks and whites will develop as a result of certain news/media events. 7. Major unexpected change in our government that will be a “shake-up”. People will be shocked. I’m hearing blackmail, conspiracy and fraud. 8. Small town farmers as well as farmers markets will see increased prosperity in the new year in large part to the public’s demand for healthful, organic and nutritious foods. Many will also choose to start growing their own food as more and more incidents of food tampering and terroristic attacks on the nations food and water supply. 9. I feel a tremendous sadness around “America” next year towards the fall season. Not sure what its about, but it will be big. 10. There will be a hike in Military Forces Suicides next year that will be swept under the carpet and away from the National Headlines. 11. There will be extraordinary discoveries in outer space. This will lead to more talks about living on the moon. 12. There will be more and more young children (elementary age) being caught with guns in school. This is going to cause more heated debates about gun laws. 13. There will be further discussions in congress about trying to come up with some kind of legislation against banks and their highly paid CEOs. Congress will try to come up with a way to make sure banks will not be able to pay out big extreme bonuses. It’s going to be an ugly fight between the banks and congress. 14. There will be an attempt to steal the presidential dog named Bo. 15. A new drug developed which helps prevent breast cancer. 16. Due to the Universal Healthcare bill passing, the insurance companies will begin to struggle. 18. Due to global warming, the change in our weather patterns will start to become very had to tell the seasons apart. 19. There will be many more mudslides in California due to the many wild fires which burned thousands of trees which helped hold the soil in place. 20. There will be an earthquake happen in the Northeast part of the country. I’m sensing around the New York area. 21. The United States will be dealing with increasing natural disasters affecting the lives of many. Will you help your neighbor or will you turn a blind eye. 22. Real estate will begin to turn around. New rules will be put in place to stop giving loans to those who really cannot afford it. Loan approval will be extremely strict. 23. I heard the word “Fire”. Expect more wildfires in the Southwest. 24. Bill Clinton will have a health issue scare. Shawna’s same prediction: Major health scare for Bill Clinton. He will be okay. 25. There will be more Sarah Palin controversy. This will put a huge strain on her marriage. There will be talk of divorce. 26. The love of the theatre will be making a comeback. People will enjoy the intimacy of live performances for their entertainment. 27. More celebrity passings. I’m receiving the name “Blake”. A famous boxer may be leaving us. Also a young, vibrant and very famous singer/actress will be leaving in 2010. She is a pioneer and a trailblazer. 28. Halle Berry will enjoy the news of another pregnancy. 29. Oprah is being prepared for a much more important role in the future that will be a departure from her public media persona. 30. You will see many movie theatres and rental stores folding up as many move towards entertainment from the internet. 31. The Balloon Boy Fiasco, not over with. 32. Michelle Obama will be tested in many ways in the new year. The nation will see what she is truly made of.